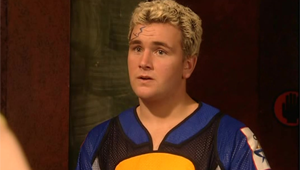 We first meet Ryan at the beginning of series one. He is with Lex, Zandra and Glen waiting to meet with the Locos. They realise they have made a mistake in trying to deal with Zoot, and make a run for it. Ryan, along with Zandra and Lex, manages to escape. After being chased by the Locos they make their way to the mall, where they are trapped in the cage by Jack. Lex makes a deal that he and Ryan will protect the others and they are let out of the cage. Ryan is constantly bullied by Lex, and the others deem him to be stupid. Despite this, he tries to stand up for what he believes. He is always willing to stand up for others, when he finds out that Dal is being sold as a slave he offers Ebony all his money, which Lex told him was valuable, she laughs in his face. He is in love with Zandra, and captures rats to prove to her that he can protect her. When Zandra marries Lex he is devastated, and decides to leave the mall. While away he finds Salene, who has been forced into 'service' due to the fact she owes for food. Ryan helps her escape. She explains her bulimia to him, and Ryan says he will support her, and look after her. Together with Salene he finds Porky the Pig, and they make their way back to the mall. At the end of series one Ryan accompanies the other Mall Rats on their journey to Eagle Mountain. While there he agrees with Salene that if the tribe disbands, they will stay together and look after the children (Patsy and Cloe). Following the devastating loss of their friends, Ryan returns to the mall with the others and helps with the distribution of the antidote. When Lex tries to sleep with Salene after having too much to drink, Ryan is furious and throws his friend out of the mall. Eventually, after a little persuasion from Salene, he goes to find Lex and tries to help him through his grief over losing Zandra. Ryan proposes to Salene and is oblivious to her obvious confusion over their impending nuptials. A joint wedding is arranged, with Lex and Tai-San. Ryan worries that Salene will not show up. However, she does, and the ceremony is a great success. During this time the Chosen are slowly invading the city and the Mall Rat's attempt to defeat them. However, most of them are captured, leaving a few behind. The men come up with a rescue plan and manage to free the prisoners. During this battle Ryan is injured, and Salene finds him by the pool. She tells him he is going to be a dad, and he comes around. During series three a pregnant Salene decides to join the Chosen for the sake of the baby. While Ryan remains a Mall Rat. Initially Ryan understands that Salene is doing it for the sake of the baby. However, he soon realises she has fallen under their influence. When he hears that he will never see his beloved child, he becomes furious and attacks the Guardian. Ryan is then taken away. The Guardian calls for his death, but Luke persuades the Guardian to let Ryan live, making him a slave in the mines. Ryan is never seen again. Salene attempts to find him in series three, but never does. The producers of the show said that Ryan would have made a return in the cancelled series six. Ryan wears a number of outfit's through his time on the show. The first time we see him he is wearing a black hooded vest with multiple front pockets, and an olive green trench coat. Ryan also wears a pair of black and white army pants with this outfit. His make up contains black lines underneath his eyes forming down into a long stretched triangle. Ryan series two outfit is a short red sleeve jumper. This jumper has a big faded green pocket on the front, which does up with button clips, underneath the pocket is a rectangle patch which sits across the stomach. The neckline of the jumper has a silver zipper outlining it. Ryan wears a pair of cream colour pants which have a slightly dark colour grey towards the top of the pants, on each side of the pants there are two huge pockets on each side of the legs, and he also wears a black belt with a silver buckle. Ryan series three outfit is a jumper with a mixture of colours and patches, the colours are all dark and bright, which contain blue, grey, black and yellow. The jumper also has a number of patterns to brighten up the top. Ryan wears a pair of long black pants with this outfit.